Last weekend, the summer KCON festivities kicked off in Newark, New Jersey with two days of convention activities and two nights of concerts. The special guest lineup included many notable YouTubers and community members, as well as a few special musical guests like Alex Reid, Heesun Lee, and Uzuhan. Day one’s concert lineup consisted of Stray Kids, HEIZE, PENTAGON, Red Velvet, and Super Junior, while day two boasted artists Golden Child, fromis_9, EXID, NCT 127, and Wanna One. The size of the convention floor is much smaller in NY compared to LA, with only a handful of non-sponsor vendors to visit in your spare time. This fact was rather surprising, especially after attending such a large convention size in LA the previous year. Instead of a focus on booths, there was much more production put into the outdoor KCON stage where special guests performed during the convention. There was also a section for panels and dance practices, along with a tent dedicated to fanbase meetings. Another new feature at this year’s convention was the Star Live Talk, where some of the groups attended a Q+A session for fans. 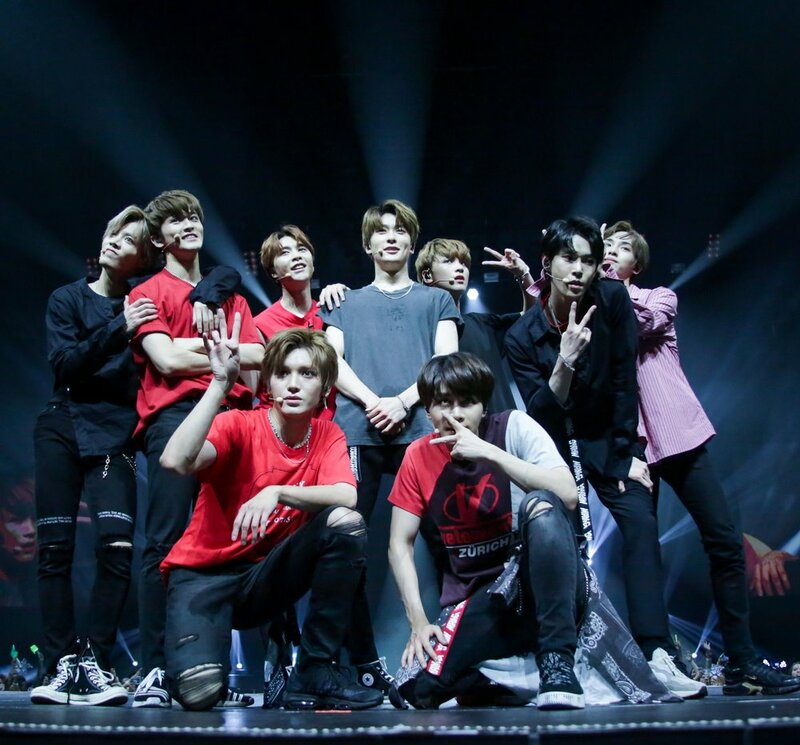 On Saturday, fans had the opportunity to get up close and personal with Super Junior, Stray Kids, HEIZE, and PENTAGON, while Golden Child, fromis_9, and EXID took the stage on Sunday. Wanna One was likely left out of the lineup for safety reasons, as their popularity posed quite a risk at the last KCON. The convention also boasts a fairly impressive food lineup focused on Korean cuisine, but be sure to get in line as early as possible if you don’t want to have to wait hours for your food. The lines for K-BBQ became absolutely ludicrous by noon on Saturday, and didn’t become reasonable until the following day. In our opinion, Saturday’s lineup was the one worth seeing the most compared to Sunday’s. The show began with opening performances from JunCurryAhn and eSNa before proceeding to the main event. After a brief appearance by Super Junior and their signature “Sorry, Sorry,” Stray Kids managed to steal the show early on. Their set began with Changbin and Han each taking a spot in the aisle across from one another respectively, giving fans an opportunity to get up close and personal with both members (and yes, we all died). Before the final act took the stage, fans got to see the members of Stray Kids and PENTAGON one last time in a special dance collaboration stage before Super Junior took over. Suju’s performances were pretty much limited to “Black Suit” and a medley of old hits “Sorry, Sorry,” “Mr. Simple,” “Bonanamana,” and “Lococo.” The group concluded the night with a performance of “Lo Siento,” bringing out special guest and featured artist on the track, Leslie Grace. Sunday’s show began with the winners of the Cover Star K competition, HARU Dance (check out our exclusive interview with them when you get the chance)! The first artist of the night was Golden Child, who performed latest title “It’s U,” followed by a performance of aegyo from each member during their ment. The group moved on to debut song “DamDaDi” before finishing off with B-side “Crush.” The newest rookie group to hit the stage, fromis_9, performed only two songs since their discography is quite limited in comparison to the other performing artists. They were, however, incredibly cute in urging everyone to check out their music and even doing quick dance covers of some more veteran girl groups. The next special stage came in the form of EXID’s LE performing her solo track “Velvet” and NCT’s Taeyong, Mark, and Jaehyun performing a special stage of “Whiplash” that got the crowd fired up for the full group’s looming performance. But first, we had EXID come out on stage full of energy with the performance of “Lady” (Hyerin SLAYED that ultra high note live! ), followed by “DDD,” “Night Rather Than Day,” and closing with everyone’s favorite classic, “Up & Down.” Despite still missing member Solji, the girls definitely ruled their performance. There were some mumblings about whether or not members from NCT 127 or Wanna One would be part of the featured artists collaboration for the night, though those questions were answered after a quick special stage that mirrored the one from the previous night featuring Golden Child’s Joochan and fromis_9’s Jiwon. NCT 127 then took the stage, finally settling the murmurings from earlier. NCT’s set was by far and without question the best performance of the night as they lit up the stage with “Touch,” “Firetruck” (now with choreography to accommodate Johnny and Doyoung! ), “0 Mile,” “Limitless,” and “Cherry Bomb.” Because the younger groups had less songs to perform, NCT got an additional set. The concert weekend wrapped up with Wanna One’s performances of most recent track “Light,” along with “Beautiful,” and “Energetic.” The boys also spent a significant portion of their stage doing fan engagements, one of which ended up with Kang Daniel dancing “Single Ladies” by Beyonce (yes, that really happened). It’s well-known that the boys of Wanna One are currently being worked to the bone before the end of their contract, and as a result their performances were likely not as powerful as they could have been. Still, the group is worth seeing before disbandment. Each year, the KCON lineups get more and more impressive. Although Saturday was our personal favorite, Sunday was still a great lineup and worth the ticket. We can only hope that this year’s KCON LA and future conventions continue with more awesome lineup announcements!